I have an old soul and I really love incorporating old-fashioned traditions and values into my modern life. The hustle and bustle of the season has reached a fever pitch in the last few decades and I think it’s wise to slow down, clear our heads and appreciate what truly matters this time of year. In generations past, Christmas wasn’t about shopping for hours on end and piling expensive presents under the tree. Instead, people used what they had to make gifts and homemade treats to give. Today I want to share with a you a few simple things that you can do to slow down and connect with those that you love. One easy thing that you can do is choose a real tree over a fake one. So many things are fake and plastic in our modern world that I think we sometimes forget the beauty of the natural world around us. Sure you can go to your local big box store and purchase a perfectly symmetrical plastic tree with a ton of shiny glittery decor to go on it, but I think the simplicity and imperfection of a real tree has more to offer our tired and weary souls. Another great way to celebrate in the old-fashioned way is to make handmade decorations. Most people didn’t have the money to buy store-bought decorations so they used what they had to make their own. Stringing cranberries and popcorn to make garland is a great idea, also making cinnamon dough ornaments is easy and fun for adults and kids alike. Another easy idea involving your kids is to make a paper chain countdown to Christmas where you remove a chain every morning until Christmas day. One of my favorite ways to celebrate the holiday season is by making homemade treats to give to those that I love. I would much rather make up a big basket of treats to give than buy a present from the store. In decades past, women used to bake for weeks before Christmas so they would have treats to give to everyone that they loved. Don’t forget to involve your kids and make it a family affair! Another important old-fashioned tradition is to make gifts instead of buy them. I love this because time is precious and if you take the time to make a gift for someone then you’re showing them how much you love and care for them. I personally enjoy receiving homemade gifts because it makes me feel loved, plus I know that it’s unique. I try to make as many homemade gifts as I can each year because I enjoy the process and it keeps me out of the stores which are crazy this time of year. An easy idea for a homemade gift is to take your favorite baking recipe and make it into a gift in a jar. Just fill the jar with the dry ingredients and attach instructions for completing the recipe. Anyone can do this and people LOVE them! The best way to celebrate the holiday season in my opinion is to simply spend time with those that you love. This can be challenging in our busy modern lives, but it’s important to be intentional about this and block out time each week to do something with your family. Some easy activities that you can do together include ice-skating, caroling, baking cookies, making gingerbread men, reading Christmas stories, looking at Christmas lights, etc. For more ideas and a free printable check out 25 Christmas Activities for Kids. I’m including this not because it’s old-fashioned to believe in Jesus, but because it’s out of fashion in our current culture. The true meaning of the season is that God sent his only Son Jesus to die for our sins so that we could have everlasting life. Christmas is about celebrating the birth of our Savior Jesus and I hope that you take the time to reflect on that and read the Christmas Story with your family that is found in Luke 2:1-20. There’s much to learn from the past about slowing down and focusing on what’s important. I hope you will incorporate some of these things into your own own holiday celebration, especially the birth of Jesus. Have a Merry Christmas! 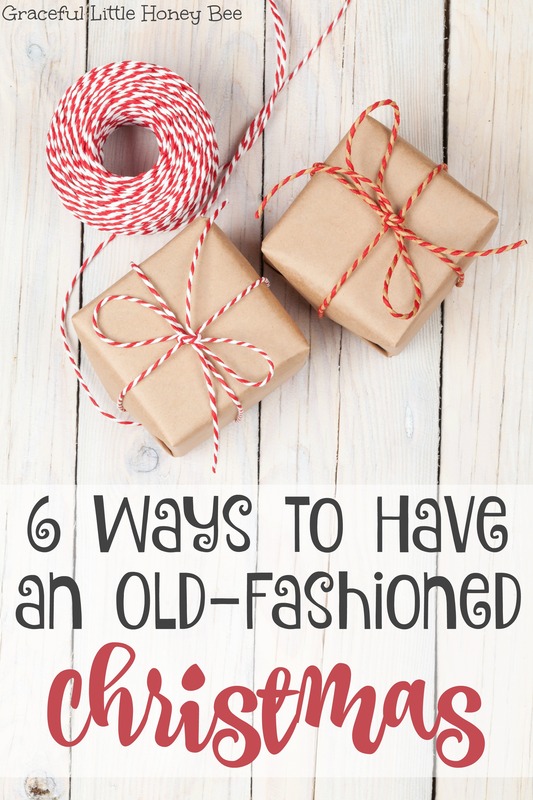 These are great ideas that not only bring old tradition back but can also save you money during the Holidays. Making gifts are more meaningful and can help you stay on budget as well. Thank you for your post. Nice. Will try the Amish bars. Thanks! I like your comments about the actual meaning of Christmas. Not much without Him.